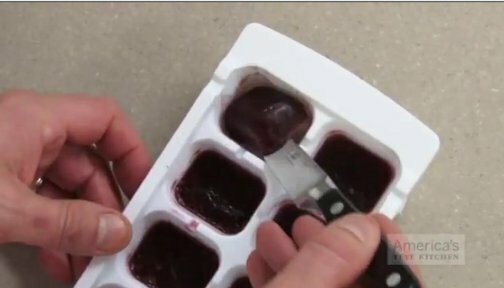 Following up from yesterday’s post about freezing food in ice cube trays: here’s a great tip from American Test Kitchen. If you end up with a bottle of wine that you want to save for cooking, but you don’t think you’ll get around to using it before it goes bad, simply freeze the wine in ice cube trays. That way when a recipe calls for wine, you can pull the cubes out and use at your leisure. This is great way to keep from wasting cheap wine. I love using my freezer! I also freeze ice cubes of leftover coffee for coffee milkshakes or iced coffee. My favorite refreshing drink from the summer – coffee ice cubes, fill glass with milk, and add a sugar free syrup. Yum!